Our family have been active within the Landscape Gardening world as landscapers and Turf Suppliers since 1946; first established by my grandfather, H.W. Rance, at ‘Three Acre Farm’, Rickmansworth. Many things have changed over the years but as the third generation, we have continued the family reputation for professional residential and commercial Landscape Gardening services specialising in garden design, excellent customer care and the supply of high quality landscaping products to the trade and general public. In addition to Landscape Gardening, we also have many years as Garden Maintenance Contractors providing our customers ranging from small gardens to mansion house grounds, schools and sports pitches with an efficient and cost effective grounds maintenance service. 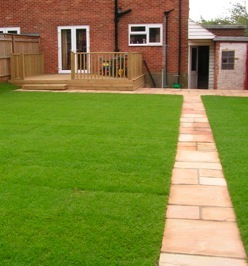 Now we are now based in Watford and offer a local Landscape Gardening service and the supply of good quality Garden Turf covering St Albans and all of the local area in Hertfordshire. We also offer our services in Bedfordshire, Buckinghamshire, Middlesex, North London and North West London. Visit our Turf Section to learn more about how we can help you with your Turfing requirements.